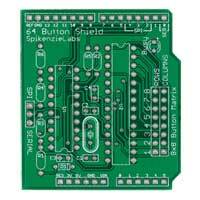 The B64 is an Arduino Shield that allows you to connect up to 64 buttons to your Arduino. You can use the B64 to make custom musical instruments, attach a lot of inputs, cool computer interfaces. 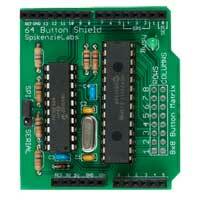 The B64 has two eight pin connectors that make an eight row by eight column matrix for the total of 64 buttons. You do not have to format the button layout in a physical matrix nor do you have to use all of the 64 buttons.